Join us on Thursday, May 2 from 6:45 – 8:00 PM as we gather for prayer with others around the globe as part of the National Day of Prayer. The theme this year is “Love One Another” from John 13:34. We will begin with a short time of worship followed by prayer for specific areas. Even if you feel like prayer isn’t “your thing,” it’s a great time to listen, praise, and reflect with others who will be praying in agreement as we seek His presence in prayer for our nation, churches, families, government, schools, communities – to Love One Another. Ladies of all ages are invited to come out for our Annual Soup & Salad on Tuesday, May 14 at 6:45 PM in the Atrium. Pick up a flyer with all of the details at the Welcome Center and fill out the tear-off to let us know you will be attending and what you plan to bring. See Robin Ritenour or Lois Smith for more information or with any questions. Jim Stuller has tickets available for the Orioles game on Friday, May 31. The tickets are $15 each. The deadline to purchase tickets is Sunday, May 12. If you are interested in purchasing tickets to the game you can sign up at the Welcome Center or see Jim Stuller. Tickets MUST BE paid for when you sign up. You can also call or text Jim at 443-340-1232. Transportation is not available to the game. Only 50 tickets are available so get yours today! Checks can be made payable to Bethel with a note that it is for the "Orioles" game. 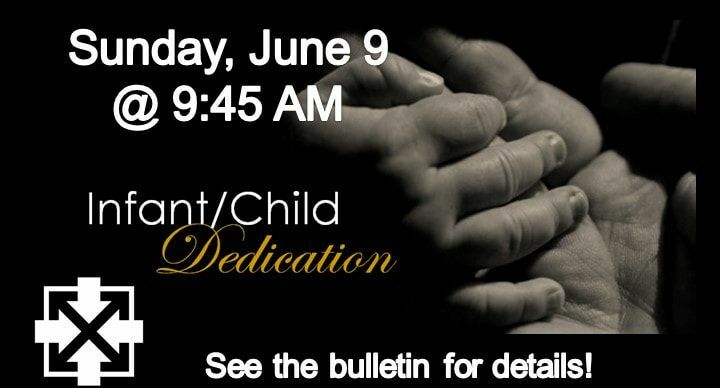 On Sunday, June 9 we will take time in the 9:45 AM service to have a baby dedication. If you are interested in having your baby dedicated, please fill out the form at the bottom of this page with your name, phone number, your child’s name and birthdate and location of birth or you may email the information to diannedell@bethelag.com. Please include a picture of your baby. Have you been wounded by someone close to you? Are you compelled to tell your side of the story? Do you fight thoughts of suspicion or mistrust? Do you battle times of discouragement or feel like you are losing hope? Don't let anyone affect your relationship with God! Join us for an amazing study of God's Word with your Bethel family! This study is open to all ages. The Bait of Satan exposes one of the most deceptive snares Satan uses to get believers out of the will of God - offense. This trap restrains countless Christians, severs relationships, and widens the gulfs between us. Jesus said, “It is impossible that no offense should come, but woe to him through whom they do come.” Luke 17:1. Nearly every day we are mistreated by others - even those closest to us. Left unaddressed, these wounds from past wrongs will wreak havoc on our lives, stealing our vitality and thwarting our purpose. Although you will encounter offense, you can choose how you will react. Please bring your Bible to class and consider purchasing a copy of the bait of Satan (it is not mandatory but would be very beneficial to have the book.) The book also includes a study guide. If you need help to order a book, please see Dianne Dell. See Tammy Black with any questions. Lois Smith is facilitating a 10-week women’s Bible study at 10:00 AM in the Atrium on the 1st and 3rd Friday of every month. This in-depth, Bible study explores the fascinating account of the tabernacle, the significance of its intricate design, it's pivotal role in God's eternal plan, the grand fulfillment of its purpose by Jesus Christ, and it's variety of meanings for your walk with God today. You will be challenged to prepare your heart, like the holy of Holies, to become a home for His love and glory - a dwelling place for the Most High God." You can either order a book on your own or Lois will take orders at the first class. The book will cost under $20. You can sign up for this class by filling out a Response Card in the pew with your name and note “Women’s Bible Study” or sign up at the table in the hallway. See Lois Smith with any questions.